Mt. Rainier, the highest of the volcanoes in the Washington Cascade Mountains and the centerpiece of Mount Rainier National Park, certainly dominates the skyline around western Washington. It is a relatively young volcano, being over ten million years younger than the surrounding ranges. 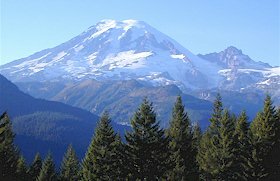 What makes Mount Rainier particularly unique, from a geographical perspective, is the 36 miles of glaciers covering the mountain. This collection of ice is the largest remnant of the Ice Age to be found on one mountain (a "single-peak glacier system") in the world. Glaciers are formed from snow that does not melt from year to year. Instead it accumulates to such depths that air is pressed out and the snow is compressed to ice. The ice gradually moves down the mountainside under the force of gravity. The glacial valleys, sometimes gouging over thousand feet into the sides of Rainier, visually accentuate the height of the mountain. Drainage from the volcano manages to find its way into five major rivers. Although it is an object of admiration and even affection amongst locals, Mount Rainier is considered the most dangerous volcano in the range. In fact, Mount Rainier has the status of being one of sixteen volcanoes worldwide to be designated a "Decade Volcano" in a United Nations program aimed at better utilizing science and emergency management to reduce the severity of natural disasters. An eruption could affect the large nearby population, sending Rainier's huge volume of ice, snow and earth into the area. Rainier also presents the hazard of avalanches and debris flows during its inactive period. A mudflow caused by steam explosions about 5,700 years ago was one of the largest known in the world. This eruption reduced the height of Rainier by over 1,500 feet and sent a wall of mud 100 feet high, cascading like a river of wet cement as far as the waters of Puget Sound. The towns of Auburn, Kent, Puyallup and Sumner are built on top of this flow. About 30 earthquakes occur under Mount Rainier per year, making it the most seismically active volcano in the Cascade Range after Mount St. Helens. To locate cities and towns near Mount Rainier National Park go to our Map of Nearby Cities and Towns by clicking above map image. Click on Mount Rainier National Park Map to locate park features such as campgrounds, roads and visitor centers.